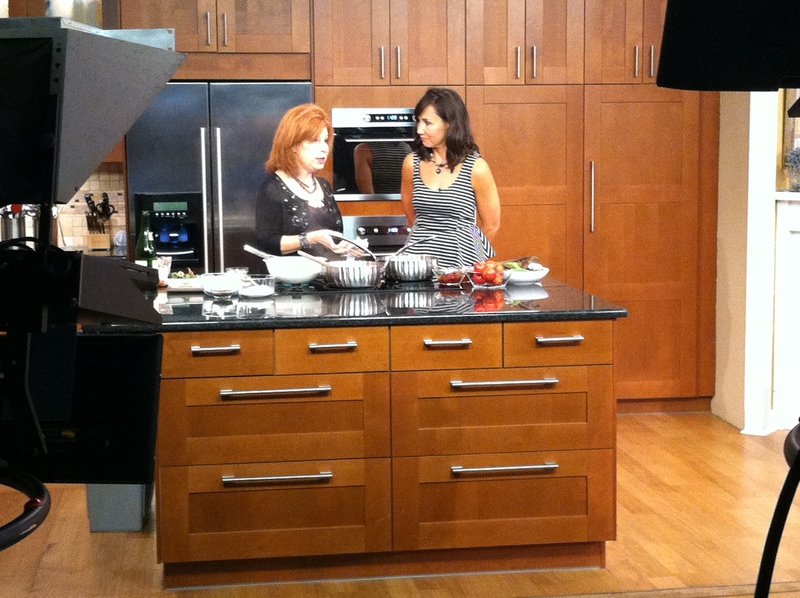 Once a month I have the great good fortune to appear in a cooking segment on WCNC’s midday program, Charlotte Today. Hosts Colleen Odegaard and Ramona Holloway have become good friends as has the staff and crew of this locally produced midday show and I always enjoy the time I spend on set. I work hard each month to cook locally and seasonally; and my September episode was no exception. Just picked local okra and tomatoes from New Town Farms in Waxhaw could have given way to many wonderful late summer/early fall dishes; but today I decided to dip and fry the okra in an easy tempura batter and use the tomatoes to make my own ketchup! 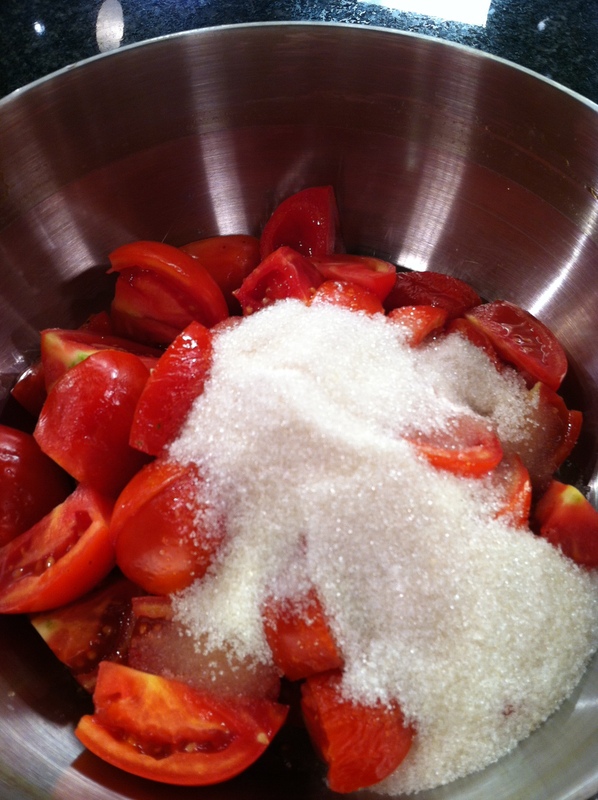 You can tweak the ketchup recipe however you like, substituting local honey or agave for the organic sugar I used. I like to add just a bit more red wine vinegar than I originally called for in the recipe as I like my ketchup more on the vinegary side – I also used my own homemade red wine vinegar – but that’s a story and a recipe for another day. 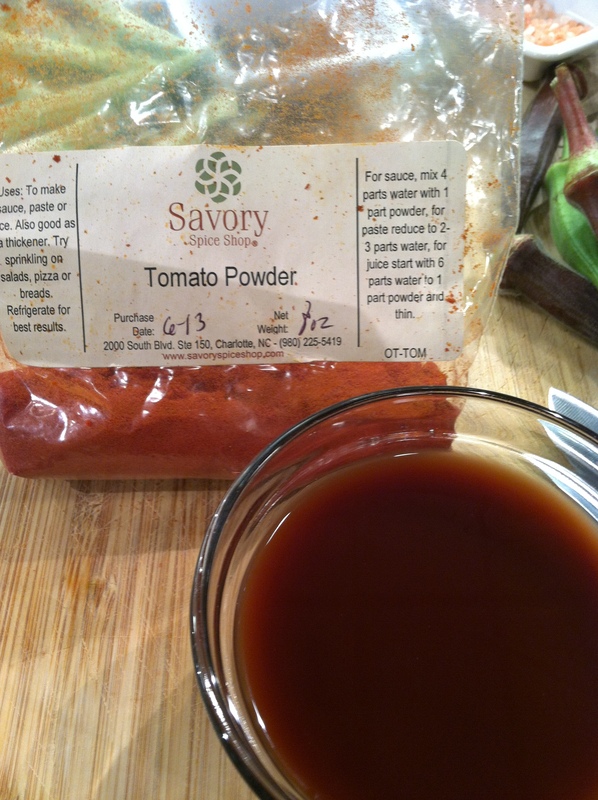 The tomato powder I used in the recipe came from the Savory Spice Shop as well, and is probably one of my favorite products there – try some to enrich the flavor and acidity of your homemade ketchup and you’ll never use canned tomato paste again. The tempura batter is an easy 1-2-3 recipe but you can spice it up with the addition of salt and pepper, chili powder, granulated garlic, finely minced onion or chive or Za’atar ( a combination of dried thyme, sesame seeds and citrusy dried ground sumac) as I did in the segment with Colleen. Or you can make the batter Gluten free by omitting the flour and blending together corn meal and corn starch for the base of your batter instead. Use any type of sparkling liquid to make the batter – sparkling water, sparkling cider, or even beer, Prosecco or Champagne! Take note , though, gingerale or sparkling clear oft drinks will make the batter too sweet. Sea salt and pepper to taste – make it spicier to taste with the addition of chili power, adobo seasononing and cumin! Whisk together the self rising flour, cornstarch and za’atar to get rid of any lumps in the dry mix before adding the sparkling water. 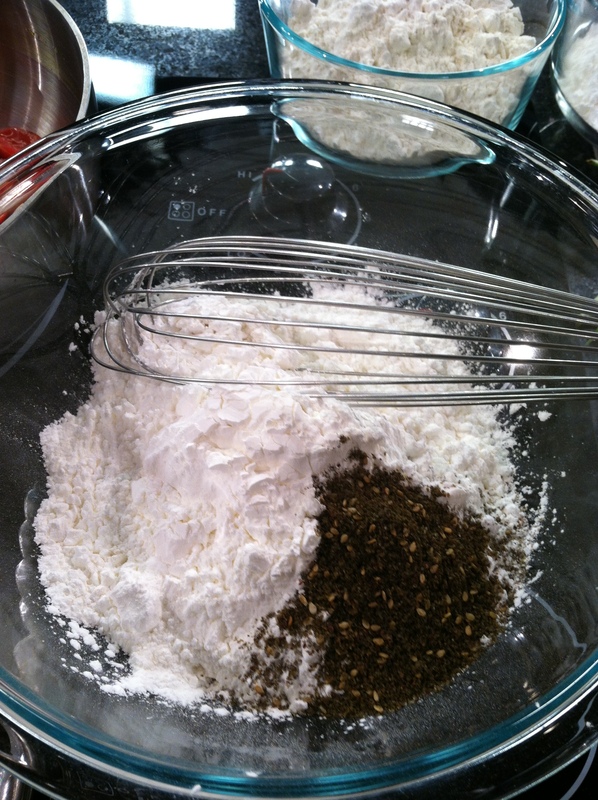 In a medium bowl, whisk together flour and cornstarch. Add sparkling water and whisk until smooth. Refrigerate until ready to use. Toss cut okra in additional flour just to cover. Heat vegetable oil in a large heavy bottomed pot using the wooden spoon test to judge readiness. – put a cold dry wooden spoon in the pan of cold oil. heat the oild up and as it becomes hot enough to deep fry in , little bubbles will form around the piece of wood just as they would around a pices of food. When bubles surround the edge of your wooden spoon, you know the oil is hot enough for deep frying. 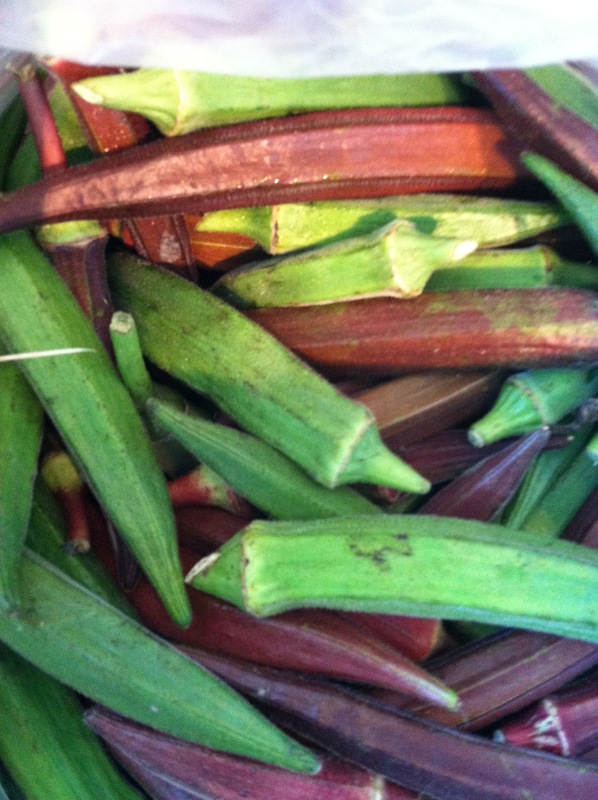 Dip floured okra in batter, one at a time, allowing excess batter to drain off. 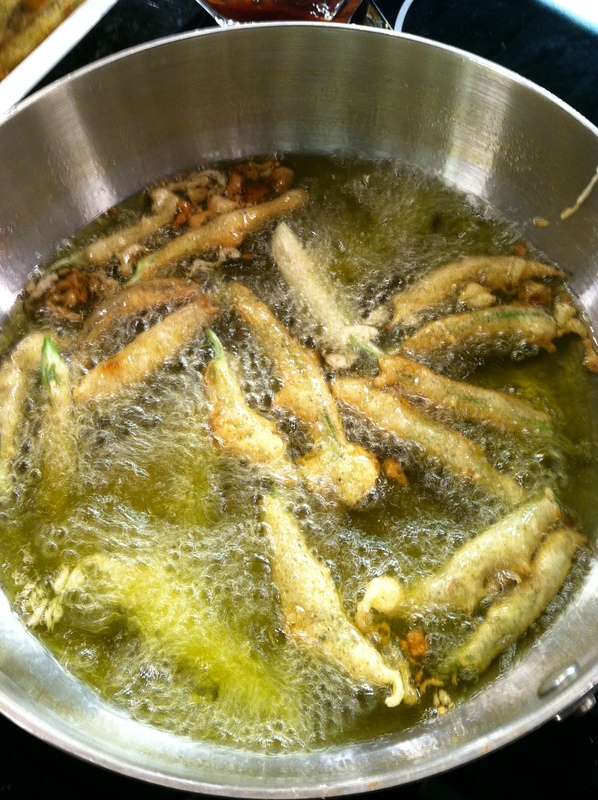 Carefully place dipped okra pieces in oil and cook until golden brown. Remove from oil with a slotted spoon and place on a paper towel-lined plate or wire rack to drain. Sprinkle with sea salt and pepper while still warm. Repeat dipping and frying with remaining okra – eat and enjoy immediately. 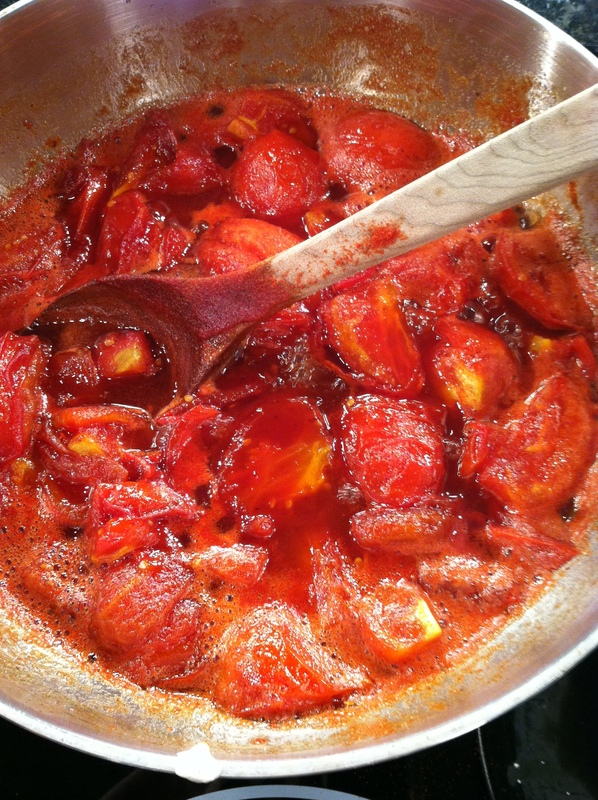 Allow tomatoes to cook down, stirring occasionally, until the mix becomes thick. Adjust seasoning to suit your tastes. Puree the ketchup if you would like or leave it chunky like a chutney!. Combine all ingredients in a large saucepan. Bring to a boil and then reduce heat to a simmer. Stir regularly until the mix reaches a thick sticky consistency. Puree with a food processor or immersion blender. Adjust seasonings to taste. Keep refrigerated. So happy to be cooking once again with my good friends, local farmers Sammy and Melinda Koenigsberg. The first time I toured the property at New Town Farms I told Sammy that if I lived there I would never leave – its a gorgeous piece of land I know you will love as well. This class begins in the kitchen as we prepare a menu of recipes featuring New Town’s chicken and eggs in addition to all that is ripe and ready to pick in the field. After we cook – and eat and drink – we’ll enjoy a walking farm tour with our gracious hosts where we will meet the pasture raised chickens and heritage breed pigs and learn about the ins and outs of farming acres of wonderful produce. 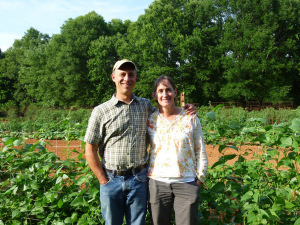 Sammy will share with us his philosophy of farming and sustainability and the importance of knowing how what we eat is grown and is raised. Its more than just a farm tour and cooking class – it’s an event that will change the way you think about where your food comes from. 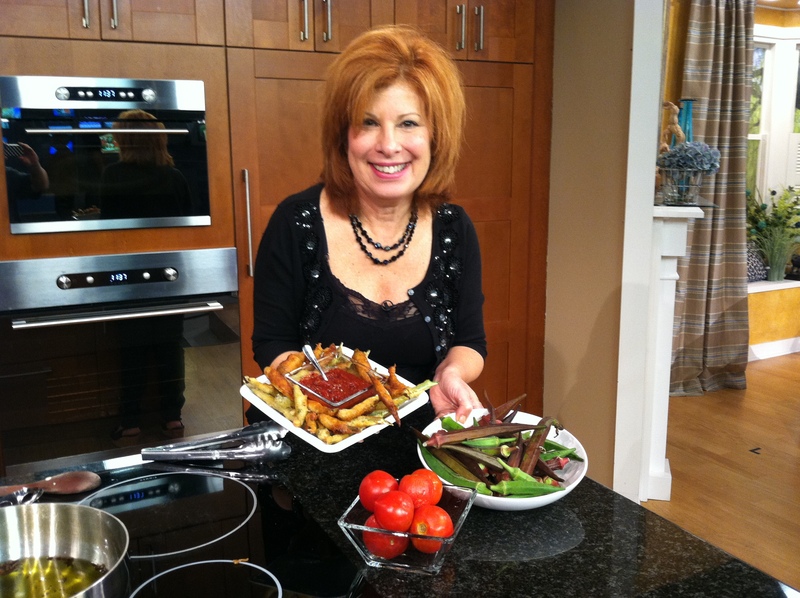 Previous Post: Fire in the City – The Heat is On, Charlotte!! !